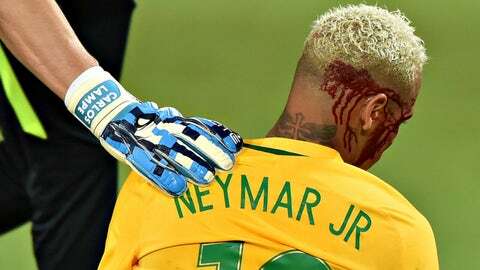 Neymar was forced to leave Brazil's 5-0 win against Bolivia on Thursday after an errant elbow from Yasmani Duk caught the Brazilian on the side of his head, opening up a bloody gash. Up 4-0 when the blow took place, Neymar was replaced by Willian after receiving some medical attention on the pitch. It wasn't the first time the Bolivians made their presence felt against the Barcelona star, however. In fact, Neymar picked up a yellow card in the 36th minute for dissent after a series of irksome challenge. On his assist to Filipe Luis in the 39th, Neymar was subjected to a bone-crunching challenge that left him in a heap. The referee rightfully played the advantage as Luis scored Brazil's third, but the tone for how Bolivia planned to contain Neymar was set. The plan didn't work, of course. Neymar racked up a goal, three assists and perhaps a pretty sweet scar in the drubbing. He'll miss Brazil's next match against Venezuela due to his yellow card, but maybe that'll give him some time ice his dome.